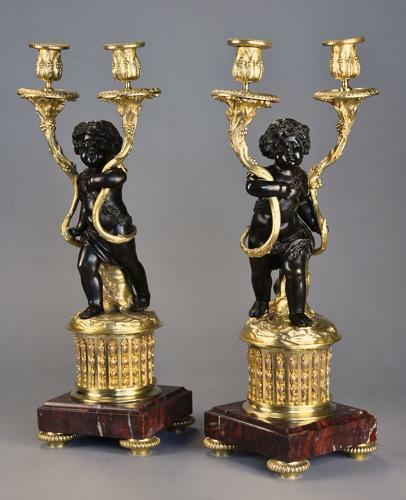 This superb pair of candelabra each consists of a fine patinated bronze Bacchanalian putto holding twin ormolu vine and grape branches with leaf decorated candle holders to the top, each putto resting on a naturalistic tree trunk. These leading down to circular ormolu reeded bases with harebell decoration supported on square rouge marble moulded plinths and terminating with four circular ormolu feet. This style of figure is taken from famous works executed by sculptors such as Claude Michael Clodion in the late 18th century, such models being very popular during the 19th century particularly in England. This pair of candelabra are in excellent condition for age, are of stable construction and can go straight into a home.